This is a low-profile rear wheel drive conversion kit featuring a 36V 17.5 Ah Panasonic rear rack battery allowing for the longest range of any solarbike system. The rear drive mini motor keeps overall weight to a minimum whilst still providing good torque assistance for long distance commuting. This kit is ideal for flatbar road and hybrid bikes that feature lightweight carbon or aluminium forks that are unsuitable for the additional torque. 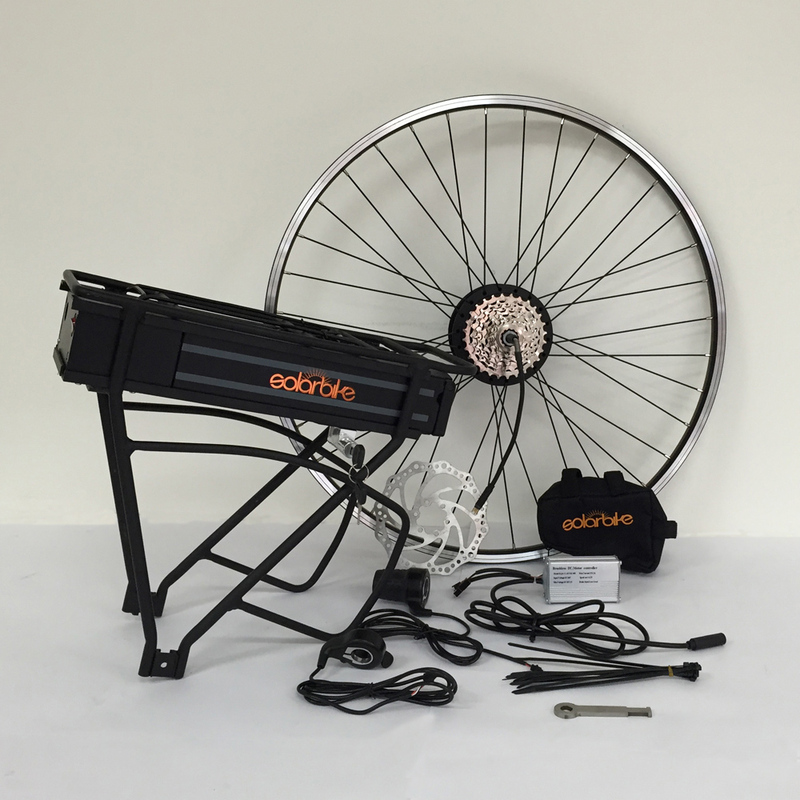 This kit includes PANASONIC 36V 17.5Ah rack battery, 36V lithium ion battery charger, motor laced into ALEX DH18 rim with stainless steel spokes, 8 speed cassette, motor, controller, twist grip throttle, thumb grip throttle, torque bar, cable ties, disc, inner tube and instruction manual. All kits are disc compatible and require a 36V battery. 200W is the legal limit for riding on the road. Power options: 200 or 350 watts. Battery: 17.5Ah PANASONIC rack battery. Click here for specifications. Rim sizes available: 20″, 26″, 27.5″ or 700c. Range and Speed: 28-32km/h. Range approximately 40-70km with light pedalling. Information: Kit includes PANASONIC 36V 17.5Ah rack battery, 36V lithium ion battery charger, motor laced into ALEX DH18 rim with stainless steel spokes, 8 speed cassette, motor, controller, twist grip throttle, thumb grip throttle, torque bar, cable ties, disc, inner tube and instruction manual. All kits are disc compatible and require a 36V battery. 200W is the legal limit for riding on the road.